Have you given a presentation about the mathtwitterblogosphere? I think this year, one of the biggest things that have happened to the mathteacherblogosphere (or whatever variant of that word you use) is that we’ve broken out of our own little community. We are no longer just a few of us talking with each other. There are a ton more of us, tons of blogs, tons of people twittering. And more and more people are joining us, because they’re seeing what good things we have to offer. And now and then, on twitter, I’ll see that someone or another is giving a talk on this community, and what it has to offer. I’d love to create a list of presentations or talks that people have given about our little world. Partly, this is my archivist nature, trying to record all of this good stuff in one place. But mainly, because as more and more of us are building talks/presentations, it might be nice to have other talks and presentations to refer to. Now I’m not talking only about hour long talks to huge groups of teachers. I mean anything — whether it’s a five minute talk to your department, to a 15 minute spiel to your school, to a three hour workshop you’ve crafted. So if any of you have given talks, and have blogged about them, could you throw your links below? And if you could include any digital files you used (powerpoint, keynote, PDFs), an outline of how you actually lead it (if it was more than just you talking, but had participants actually do things), and anything else that might be useful… that would rock. And if you have given a talk and haven’t blogged about it, BLOG ABOUT IT! Or if you don’t have a blog, because you mainly twitter, you can write a guest post on my blog if you want! I hope to compile them as a list on this blog, or maybe include them on a special page on the mathtwitterblogosphere site. Full confession: I haven’t really given talks or anything. I’m not really a teacher leader or anything and it feels weird to give talks when I feel like I’m not an expert teacher or a leader or whatever. So I’ve only done one talk to new teachers last summer [post here]. Here is a 7 minute presentation I gave at a summer math conference/workshop (PCMI) which I think went really well [post here]. Not sure if that’s what you’re after but I gave a talk about Mathblogging.org and Booles’ Rings at ScienceOnline 2012. Could you share the talk itself? I am super curious! I’m afraid I can’t :( SciO is an barcamp/unconference style event. I gave a 5 min blitz introduction and the rest was discussion. Here is my presentation: http://oldmathdognewtricks.blogspot.com/2013/02/my-presentation-on-math.html. I will be plugging mathtwitterblogospher during my part of a session with David (@delta_dc) and John (@mathhombre) at MACUL on March 22. Here is the abstract: In the US, professional development (PD) is typically something done to educators, not with educators. Traditional PD often comes in the form of some mandated process or product educators are expected to use in their teaching. This external approach can be very limiting, isolating, and disempowering. Social media offers educators an alternative to “PD as usual.” Using various online platforms, educators connect with colleagues across the world. They share teaching ideas and seek feedback. Not only do they grow professionally but they also contribute to further developing the profession. We want to share how we use social media to engage in our own form of sustainable, personalized, professional development. This includes connecting with other professionals on Twitter and sharing resources through links to blogs and Pinterest. Last July, a group organized their own Twitter Math Camp in St. Louis in order to meet and share ideas face-to-face. These are the stories we want to share in this session. Will you share the presentation with us, after you give it? It sounds FABULOUS, and you’re giving it with such awesome people too (and you being awesome yourself, makes a trifecta). AWESOME. 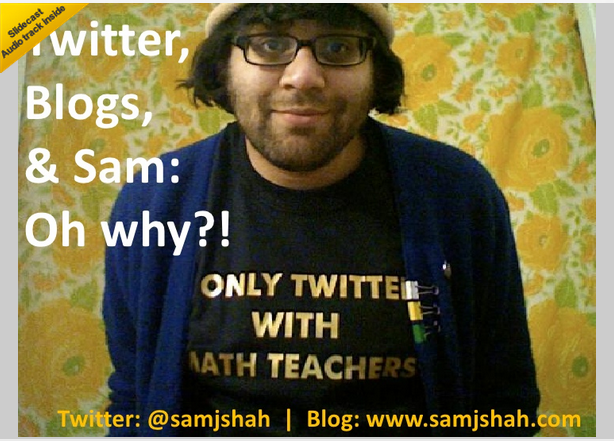 I’ve included the mathtwitterblogosphere in a presentation on technology in math, now twice. I’ll probably leave it there for a while. > I’m not really a teacher leader or anything and it feels weird to give talks when I feel like I’m not an expert teacher or a leader or whatever. Uh, Sam, I hate to break it to you, but you are, in fact, a teacher leader or anything, You are definitely an expert on the mathtwitterblogosphere. Hope that news doesn’t rock your world too much. I gave a workshop talk about Algebra II activities and I threw in how awesome blogging was and told everyone about your website and the other amazing ones that I have stolen ideas from! I hope more people can see what a great resource blogging can be. Keep it up! And I’m looking forward to helping with Jamie’s MACUL talk! Thank you, good sir. Looks like an awesome presentation. What I like most about the rise of math teaching bloggers is the way it models writing about and for math for our students. Here’s my “math teachers and social media” talk, as given to the Global Math Department: https://www.bigmarker.com/GlobalMathDept/22July2014. I stole heavily from Sam’s and Meg’s. This is pretty lengthy and takes newbies from setting up Twitter Accounts, to participating in Twitter Chats, to reading blogs. …um, I just realized the other isn’t online right now, but it was about online resources, so less directly MTBoS anyway. I also tell EVERY teacher I met about it, and am a VERY active and zealous prophet!